You can see the tomatoes by mid summer have filled the cages to the max! 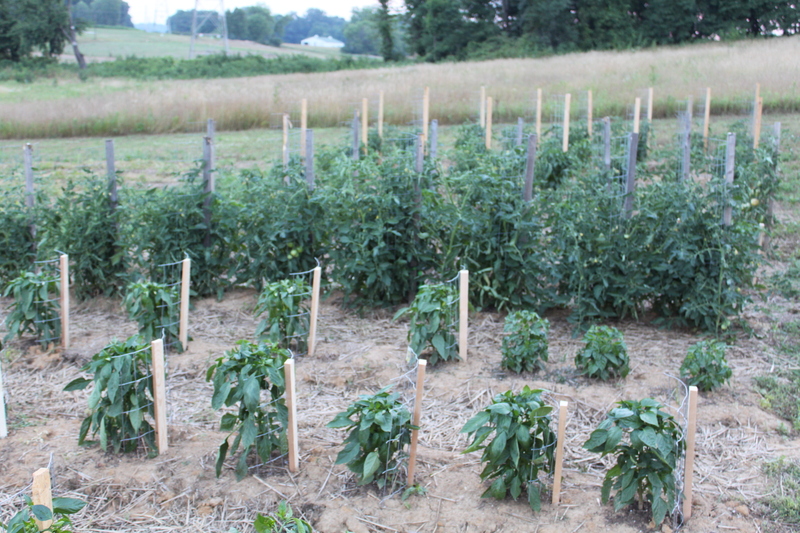 Over the years we have tried several methods of staking and tying up our tomatoes. As the tomatoes start growing by leaps and bounds, you don’t want to risk the plants becoming damaged by leaning over and touching the ground, allowing disease and infestation to occur. So do we use a stake or a cage? 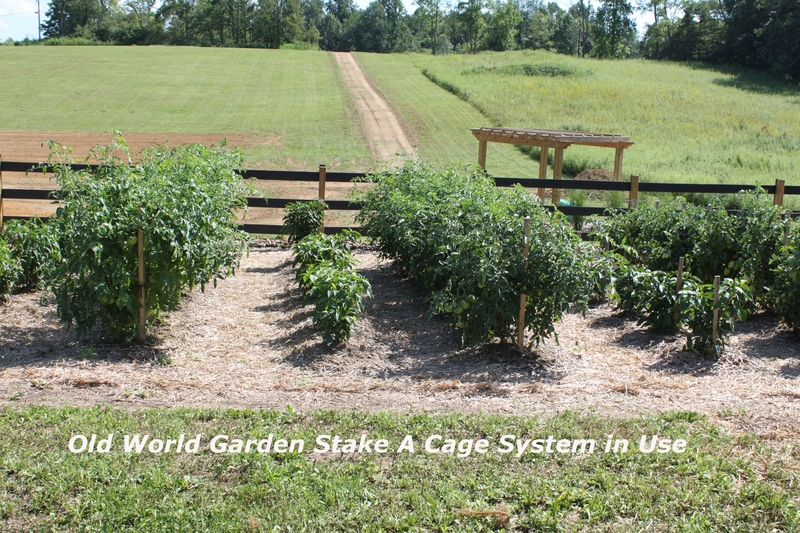 Well, we now use what we call our stake-a-cage method to support the tomatoes as they grow. No, we didn’t find this on an infomercial, rather, we developed this method by pure accident. Last year at this time, we had just moved the chickens into their permanent home after completing construction of “The Coop”. 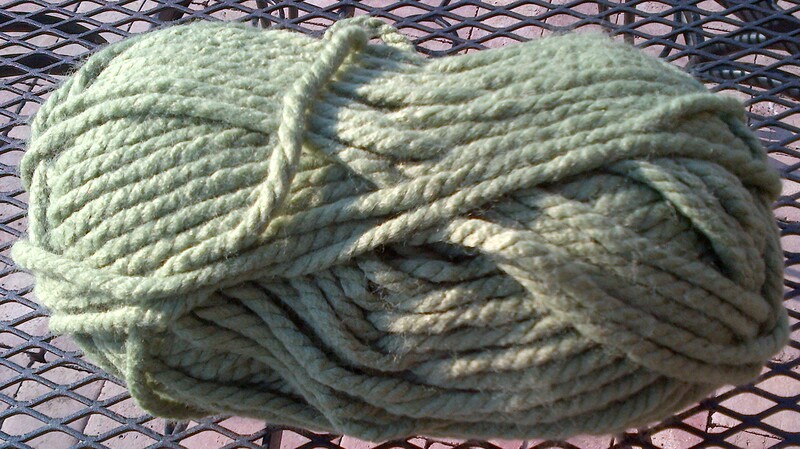 Inexpensive, thick, super soft and flexible yarn is a great way to tie them up. We had left over fencing wire from building the outdoor run, as well as large stakes that we had used to stake out the area where it now sits. With some wire cutters, u-nails, and a hammer – we built the ‘best of both worlds’ for our tomatoes. We simply attached an 18″ wide x 30″ high wire grid cut from the fencing to the 4′ stake with the U-nails. We now had the support of a strong stake, but also the support that a sturdy wire cage provides. Whala – The Stake-A-Cage was born! The best part – the cage is open in the front, allowing us to easily tie up the plants to a broader area, it also allows for picking the tomatoes without dealing with the hassle of reaching through a cage during harvest time. 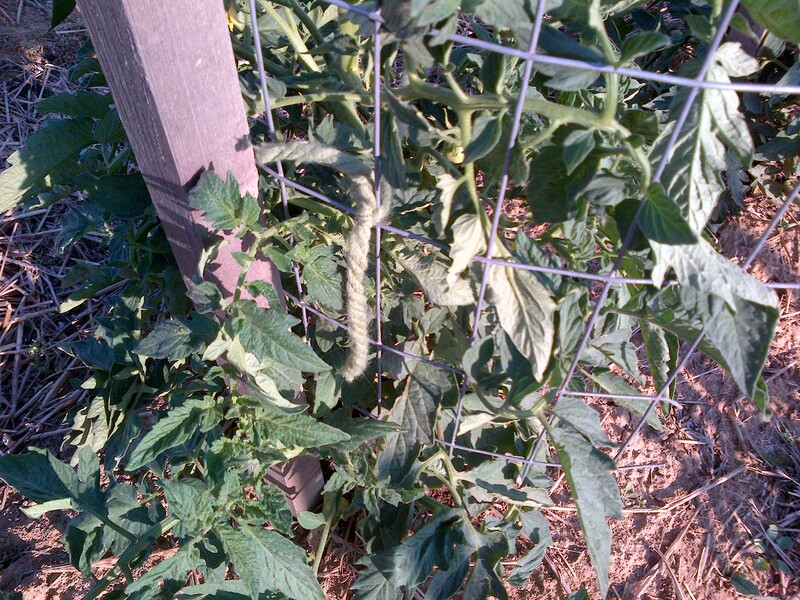 We then use a super soft and bulky piece of yarn to tie the tomato vines to the Stake-A-Cage. We simply cut 12-18 inches of the yarn, tie it around the stalks and wrap the piece around any of the metal grid area as it grows throughout the season. The yarn is really an inexpensive way to tie up your tomatoes (we spent less than $3 for 86 yards of material), but there are other benefits as well. Your family members aren’t missing their favorite old t-shirts anymore and the pantyhose that your wife needs for that fall wedding will still be in her dresser drawer! You can even buy your yarn in a green color so that your garden ties are camouflaged in the background, allowing for a neat and clean appearance to the garden! For as simple as it was – it is amazing how much it has helped in our tomato harvests! ← AND THE WINNER IS……. Greetings, this season I did the same thing (with a twist) and today I found someone who thinks like I do, woohooo! yes it did work pretty well, how cool, I also used yarn, how neat. anyway the twist was I used a piece of 1 1/4 PVC instead of a wood stake, I capped the end I put into the soil, to help keep soil out as I drove it into the soil, i drilled small holes in the PVC that went below the ground, when i went to water the plants I would fill the PVC tube full of water and it would leech into the root system providing a nice source of water to the root system of my plants. It did seem to work so far this season, I hope others will think outside the …..cage. have a great day. Phonetically Viola is just as you spelled it…whala. But spelling is important so the correct written word is Viola! I always add an exclamation point, seems right when using that word. Love the web site.